Eddie Cochran was one of the iconic figures of the rock ‘n’ roll era, his mystique and legendary status heightened by his tragic death in a road accident in 1960 when he was only 22. With heartthrob good looks and stylish image, he featured in the movie “The Girl Can’t Help It” even before he had a hit record, and came readily to stardom as the rock ‘n’ roll explosion of the mid-‘50s reached its height, his records epitomising the teenage aspirations and frustrations of the times. He was a fine songwriter as well as an innovative performer and recording artist, and in his short career he made some of the most memorable hits of the rock ‘n’ roll era, which have become among the most covered songs over the years, finding their way into the repertoire of every rock ‘n’ roll band across the world. 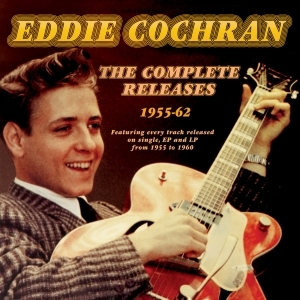 This great-value 57-track 2-CD collection brings together every recording which he released during his brief career, including his early singles as part of The Cochran Brothers before he joined the Liberty label, plus some material which was rel;esed on singles and LPs posthumously through to 1962. It comprises every A and B side of his singles, plus all the other tracks released on EP or LP during his lifetime or soon afterwards, which were not featured on a single release. It naturally includes landmark records like “C’Mon Everybody”, “Twenty Flight Rock”, “Summertime Blues”, “Somethin’ Else”, “Three Steps To Heaven” and “Jeannie Jeannie Jeannie”, and many more classic examples of his style. It provides a definitive overview of his career and is a marvellous souvenir for anyone who appreciated his unique talent.